How important are your clients to you? In a tough economic climate, companies have to work even harder to show their clients why they chose their service. Clients can easily decide to go elsewhere if they don’t think they are getting value. So, it’s never been more important for you to ensure that your client reports give your clients the KPI information they need in a way they can make decisions from. To help you create a client report that will impress your clients, this article shows you 4 ways to ensure that your value is communicated effectively, using data visualisation as a useful medium. A great client report will also enforce your relationship with your clients, meaning they&apos;ll keep coming back to you. In many cases, your executive summary is actually more important than the rest of your report. This is because your clients are often pushed for time, and therefore will only read this part. Therefore, your executive summary must not be just a brief overview of the entire document, but something that can stand as a report in its own right. So, how can you use data visualisations to make your executive summaries better? In each of these points, data visualisations really help! Walls of text aren’t a very good idea, as they make skim-reading and searching for information very difficult. 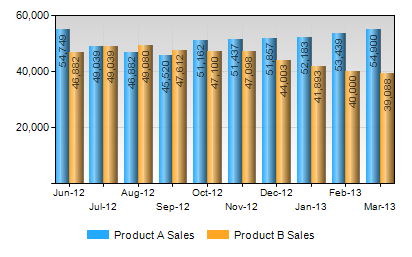 Using charts allows you to consolidate a great deal of information into a small space. For example, read this excerpt from an executive summary from an advertising agency. 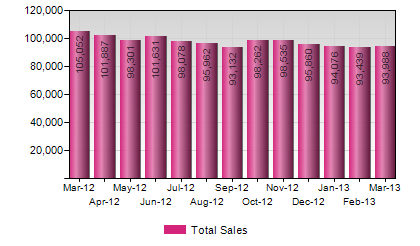 Now, let’s see the exact same information, but in the form of 2 charts. Which did you understand better? Putting our information into chart form has not only saved space in our summary, but also let your clients directly see what you have achieved (and not have to sift through a wall of text to find it). Remember, when creating your executive summary, you have to give your clients something they can quickly read and take action from. Data visualisations let clients quickly find what they need, and therefore increase the value of your reports in the eyes of its readers. Above all, keep this part of your report concise. As client reports will be one of the main ways which your value as an investment will be communicated, you have to ensure that what your client takes away from the report is exactly what you intended. While every report you write for your clients will have a different purpose, you should always reinforce your most important points. A great way to do this is to present the same information in different ways in the same report. Clients respond most positively when your information is presented in a way which draws their attention. If your report is mostly text based, you’d be surprised at how effective a table or chart can be just to hammer your message home. In principle, this is similar to what we talked about with the executive summary. Don’t use text just to explain the picture; use it to state what your clients need to know, and have the visualisation independently show the same message. This way, your information is less open to misinterpretation. Even if you bend over backwards and do great work for your clients, you’ll be surprised at how little they appreciate all your hard work if you don’t communicate what you’ve done in a way that they understand, and not in lots of jargon. Therefore, my advice is to keep things simple. Remember, whatever data you have included in your client report only has as much value as readers think it does. Therefore, write your reports with your clients always in mind. Just follow these two tips. · Always present high-level information first, with more detailed information following on from it to give context if needed. · Show why the client should know what you’ve put in your report. For the second point in particular, explaining to your clients why you’ve included certain information is much easier to do using data visualisation. Including a chart of this information, or comparing it to information in your executive summary can help your clients see the association between seemingly unrelated data. 4. Present Your Reports in Your Own Style. Your client report is just as much a product of your business as the service you provide. Therefore, your reports must show not only your professionalism and expertise, but also the relationship which you have with your clients. Take a few minutes to think of your company culture and how you speak with your clients. Now, translate that rapport to paper. While reports by and large need to be quite formal, you can always find ways to incorporate your culture, whether that’s by use of language, or through how you present information visually. Consistency in your presentation creates confidence in your clients and helps you stand out from other companies in your sector. 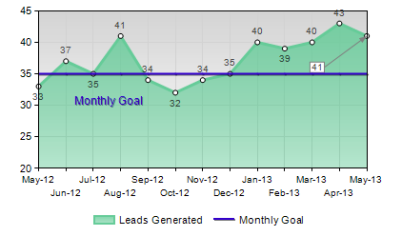 Show your clients the value you give them with your client reports. In companies with a B2B business model, the relationship between business and client is essential. Therefore, when a business communicates how service is progressing, clients need to be able to see the value which they are getting, even if this progress is negative. This article has shown you 4 ways which you can effectively communicate what you’re bringing to your clients, both as a service and as people. A great client report allows better decisions to be made, which ultimately lead to better business performance. Useful data combined with easy-to-understand visualisations will help your clients take action effectively. While creating client reports can be time consuming, dashboard programs such as Target Dashboard can create these reports for you automatically. To see how quick it is to create these reports, why not sign up for a free trial, or log in to your pre-existing trial now!